Neil is back. Not that he ever really went anywhere, but I have been waiting to hear something like this from him for a long time. The folky melancholy is still present in some of the tunes, however here they carry an extra edge. Also on this CD we hear something that has been missing for a decade or so, heavy, angry grunge guitar. Neil touches on his familiar love songs, political commentaries and cries for social justice. But what is new or revisted here is that I feel that I am listening to retro Neil post CNSY and his legendary solo stuff that preceeded that. I wonder who we have to thank for this bit of time travel? It would have to be Daniel Lanois. As a producer he has had flashes of genius and usually brings with him a distinctive sound and overall atmosphere to the finished project. He has had a reputation for avant guard studio methods and fondness for vintage instrument sound. In Le Noise I sense something is different with Neil yet I don't hear Lanois exactly either. What I did hear though, I like. 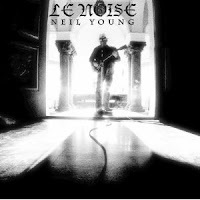 If its been a while since you bought a Neil CD, this is the one you will need to pick-up to renew your faith that the old man can still rock.